Current Message: Tough to say, but there are fish! Comments: The Living Seas was one of those attractions that had been planned since the start, and as such was designed more around the standards and protocols of a Disney theme park experience than it was the corporate message of any one particular sponsor. This may have as much to do with the fact that its projected theme - deep undersea research laboratories - still have not come to pass, as much as any practical factors. The company they finally got to underwrite the show - United Technologies - is a massive defense contractor, and through the 80s and 90s was perhaps best known for providing things like water heaters to suburban homes. They also happen to own Otis elevators, a company Disney has used since the early 60s, which is probably why the original plan for Neptune to appear and "pushing back" the sea so we can explore it eventually gave way to a elevator ride to the ocean floor. The Living Seas was, let's be clear here, not great. It did, however, have one of the most potent single things in Future World, which was a the progression of its show. 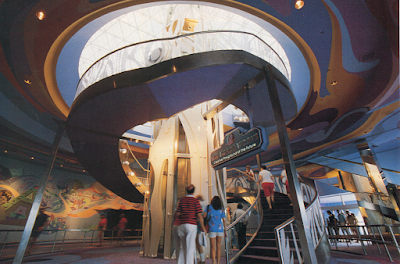 Entering through a space designed to resemble a museum and allowing its audience to settle into a theater very much like the other Future World pavilions, the wall carpeted expanse suddenly gave way to a dreamscape. At the suggestion of the narrator, an animated grid suddenly became a real filmed space, and the theater opened into exactly what was just seen on screen. Although accomplished with the simplest of means, as a theatrical frisson it was extremely impressive. The rest of the pavilion never quite lived up to the force of that idea, but rather relied on an accumulation of details to make its environment seem convincing. It was very easy to forget that in Central Florida you were nowhere near an ocean, especially not one like the coral reef depicted in Sea Base Alpha. The hydrator trip and "Sea Cab" ride to get into the pavilion set an expectation, and the hydrator trip to be allowed to leave fulfilled it. Some guests even thought the hydrators actually brought them somewhere! In its day, in an era where popular thought was still dominated by memories of the space program and Star Trek, The Living Seas had an appealingly low-rent sci fi vibe and just enough of a presentational effort to seem reasonably convincing. Yet as time passed and Future World attractions began to change, demanding less thought from an audience that was no longer expected to consist primarily of adults, demand for the attraction and its particular brand of Next Generation-era sci-fi diminished. The Sea Cabs got a new spiel making announcements about Illuminations and all but begging visitors to stay and see the exhibits after disembarking, and then were shuttered in the economic downturn after the Millennium. The addition of Turtle Talk With Crush a few years later sealed the fate of the pavilion, and the whole thing was done over with a Finding Nemo theme in 2005. The pre-show, the hydrators, and everything else from the old theme was stripped out. What Needs To Change: The basic problem with The Living Seas has always been that the entire pavilion is built around an aquarium from 1986, and it's an aquarium that really has not ever been updated. But even when it was brand new, the sci-fi presentation of the material far outweighed the actual value of the aquarium; the impact had to do more with how it was presented than what it was. As time has passed, the scale and detail of that aquarium isn't quite as amazing as it once was. Many large cities now have much more ambitious aquariums as regional tourist attractions, and those aquariums now have Disney-style rides and 3D shows in them. All of this makes it hard to know what to do with The Seas. Much of the educational and informational value of the attraction was a little abstract to begin with, being less rooted in any particular vision than it was more generally advocating for undersea research. Today, James Cameron can knock together a more compelling case for the mysteries of undersea life than Disney can. New Sponsor Suggestion: This is a pavilion in need of a reason to exist. Disney is going to have to be involved somehow, and frankly I don't think there's a compelling reason to jettison the Nemo dark ride -- but there still needs to be a larger context for the still impressive features of the pavilion to have real value. There are government agencies that do undersea research, like NOAA and NASA, and perhaps forming an advisory committee of such research centers could pave the way for a re-introduction of the science angle which made the original pavilion credible - and striking. Comments: It's worth remembering that through the 60s, 70s and 80s, one of Disney's most profitable divisions was as a supplier of quality educational films to schools. An outgrowth of the World War II educational film division, in the days when teachers had to haul out projectors and thread up films, the best products came from Disney. EPCOT Outreach was a physical embodiment of this side of the company - in fact, it's possible to argue that the entire of EPCOT Center was built on the back of Disney's two most successful divisions in the late 70s - outdoor recreation and educational films. In its heyday, besides a general purpose question and answer desk, it had a teacher's lounge complete with attraction previews and even lesson plans built around the attractions. The trouble is, with the opening of the much more exciting Disney-MGM Studios in 1989 - where seemingly every attraction had an explosion - combined with a bad economy, attendance at EPCOT Center plummeted. To take up the slack, WDW heavily marketed EPCOT Center to area schools as an affordable field trip option, and it worked. Practically the whole place became a sea of visiting Florida schools. This led directly to the efforts to court a younger audience with flashier, more exciting attractions which has given us the uneasy mix we have today. EPCOT Outreach ate EPCOT Center alive. 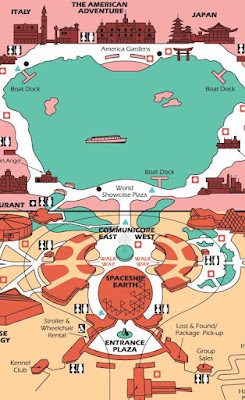 I think this is still a terrific idea for a feature of EPCOT, but for it to mean anything, practically every Future World pavilion has to be updated. Universe of Energy cannot be soft-pedaling info from the 90s. Living With the Land cannot be presenting 80s-era pest control solutions as cutting edge. The Living Seas needs to have an actual point of view. some of the materials shipped out to California - an appropriately sad end to a final scrap of EPCOT. Comments: Here's where the dissonance between what EPCOT is preaching and reality really starts to set in, and The Land is currently one of the most popular and throughly refreshed of all the Future World pavilions! Since 1982, concepts such as natural foods, pesticide-free, GMOs, sustainable seafood and farm raised fish have become hot button issues of our time, and Farmer's Markets and produce Co-Ops have become crucial community centers for many - yet nowhere in The Land can one even find an explanation of what Organic food is. Instead, Listen/Living With the Land has been passing on the same outdated information about pest control and farming since 1994. This message made sense for Kraft, whose name has become synonymous with processed foods. But this is one of the few attractions where the entire cultural discussion of its core concept has pivoted away from where it was in the 1980s. The "open a can" school of cooking of the 60s and 70s is a cultural memory. As a reflection of reality, The Land doesn't made sense for the vibrant current American food culture at all. What Needs To Change: The basic concept of this attraction is surprisingly resilient - you wouldn't think that a boat ride through a greenhouse would be a crowd pleaser, but people still respond to this. And still, scientific trappings aside, the notion of growing crops to be used onsite could be argued to be "Farm-to-Table" before the words even existed as they do today. Urban farms and rooftop gardens around the country are producing organic crops using methods like hydroponics, and the results look very much like what The Land has had since the 80s. This is an attraction that needs not so much wholesale change as a redirected emphasis on where the food discussion will be in 2020. New Sponsor Suggestion: This will result in eye rolling, but what Living With the Land needs is a sponsor with an actual commitment to modern ethical food cultivation.... and it may as well be Whole Foods Market. Whole Foods has ridden the tide of the local and organic foods movements to corporate heights, and many Whole Foods have become education and community centers. If there's a single company that has the resources and commitment to redirect Epcot's The Land in the modern direction, it's them. Oh, and bring back the "Listen to the Land" name and theme song, please! Original Message: Man's relationship with nature has always been fraught and complex. Comments: Symbiosis was one of the original EPCOT attractions most noteworthy for its refusal to let its audience off the hook. Designed as something of a corrective to the test-pattern TV eyes corporate angle of Listen to the Land, Symbiosis was beautifully shot and edited - but didn't even seem to arrive at a coherent point. If anything, it seemed to be suggesting that it wanted to arrive at the same point as Godfrey Reggino's "Koyaanisqatsi" without the avant grade trappings. 1994's Circle of Life is chipper and direct where Symbiosis was artful and kind of dull, but again Disney's refusal to update anything at Epcot means it's now as much of an byproduct of a time twenty years past as Ellen's Energy Adventure is. A 90s take on environmental awareness, using Lion King characters and the concept of the "Circle of Life" isn't a bad one, but in execution it doesn't say anything that Fern Gully didn't do about as well (and let's be clear here, Fern Gully didn't do anything well). The 90s in general were a hotbed of "activism" for rainforests and other endangered areas, even if this awareness most often manifested itself in, say, watching Captain Planet and dropping pennies in tin cups, feeling good about doing very little. A somewhat embarrassing reminder of this era, Circle of Life is fine, but there isn't a single point made in the film that isn't done in a much more compelling way at Animal Kingdom. What Needs to Change: Disney has used the Symbiosis theater off and on to promote "Disney Nature" films, but I think the real question that needs to be addressed is why The Land needs a film at all. As it is, the themes of utopian agriculture, health and fitness, and food preparation were already weirdly spliced across Horizons, Wonders of Life, and The Land. If The Land is going to specifically be about farming - and let's just wave off the relevance of Soarin' here, because it doesn't fit and never will - then the film shown here needs to be on message with the boat ride to really work. If not, Disney should get rid of the theater and use the space for something new. Comments: If you were a fan of the kind of entertainment Disney had produced through the 60s and 70s, then EPCOT Center sometimes seemed amazingly thin on the old school Walt Disney charm. I personally think this opinion was wildly overstated - and there's even less there now than when it opened in 1982 - but Kitchen Kabaret, Journey Into Imagination and El Rio del Tiempo were classic WED rides in a park basically devoted to serious themes. WED saw this problem coming, and it's nice that they did create Kitchen Kabaret as a call-out to the kind of theater shows that were Disney's bread and butter for a long time. Like the Tiki Room, Country Bears, and America Sings, Kitchen Kabaret was whimsical, lightweight, and kind of insane. Ostensibly devoted to furthering awareness of what was then the USDA's four major food groups, education was a distant second to Kitchen Kabaret's mandate to entertain. Patterned very heavily on the presentation of Country Bear Jamboree, Kabaret was perhaps not as pokey as Mickey Mouse Revue but fairly sedate compared to Davis and Bertino's truly madcap shows. For those of us who were able to visit EPCOT Center before it was torn out, this show as well as Listen to the Land were a sure bet and usually mostly empty. It wasn't until I was an adult that I appreciated the throwback vibe of the Kabaret, but it hardly mattered: the singing food characters were funny and kind of freaky, and the show barely took up ten minutes of your day. It is well remembered for good reason. The replacement, Food Rocks, was motivated both by the comparatively empty state of most showings of Kitchen Kabaret, and the publication of USDA's convoluted Food Pyramid in 1992. Like most of Disney's 90s output, the "Hip n Edgy" Food Rocks sometimes seemed more like a compendium of "Dad Jokes" than a real show. Besides updating the roster of musical talent from the 40s to the 90s, and the creation of the truly memorably bizarre "Füd Rapper", neither show was really all that comparable nor really all that much about actual food education. Kitchen Kabaret's true advantage was its startling oversized kitchen set and intricately sculpted, very amusing food based stars. I'm not sure we need the singing food show back at Epcot. Kabaret fulfilled its role of warming up the sometimes inhuman dimensions of Future World, but both shows pointed towards something shaky in conception about Future World. Was The Land about food and nutrition, or the growing and managing of food? Thanks to the Kabaret and Symbiosis, in 1982 it was both - but then why was Wonders of Life necessary? The original version of The Land as developed in the 70s was entirely about natural environments, a sort of above ground Living Seas, a concept still present in the pavilion today as the "biomes" on the boat ride. With the removal of Wonders of Life, The Land has an opportunity to consolidate its themes under one roof, and even if the concept of how to use and cook food isn't conveyed by singing foodstuffs, the discussion still has a place at the table at The Land. Comments: If EPCOT Center had a beating heart, it was this ride and Horizons. Neither ride was perfect - the final third of Journey Into Imagination was far less interesting than its first two thirds, and the climax was more of an anti-climax, built around the concept of film technology, because Kodak was the sponsor. But unlike the case of Horizons where we have to hem and haw and allow for "well, if this were updated...", Journey Into Imagination requires no excuses. The same, sadly, cannot be said for its two replacements, but thankfully conveying a sense of the history of this pavilion is beyond the scope of this article. What can be said is that the current salvage version was a fine attempt to brush up an attraction that almost nobody liked. But, by its very nature of being a salvage of an attraction almost nobody liked, the interim version still has a legacy in the current attraction. The conceit of the "Imagination Institute" was never especially obvious to begin with - being as it was a justification for the placement of Honey, I Shrunk the Audience - but nobody designing an attraction about creative activity from scratch would choose to base it around the five senses. The most resonant attractions have a streamlined conception of content and form - Soarin' delivers exactly what it promises on its marquee. The name Journey Into Imagination promises an epic scale that does not logically segue to screens and office doors. This should be one of Walt Disney World's signature attractions. We deserve better. What Needs To Change: like Horizons, this is one of those attractions where I believe a revival is in order, at least in part. When you speak about Journey Into Imagination with people, what you discover is that people remember and are talking about the first half of the attraction - the Flight to Imagination, Dream Port, Art Room, and Thriller Room. There certainly is no reason to do a full-scale revival of the ending, where the cars go chugging down a hill while blurry photos of the riders are displayed. If a full-scale version of the Flight to Imagination cannot be recreated, then this section could be relegated to a pre-show room and have the riders board in the Dream Port. Following the Thriller room, what a new version needs to emphasize is that there are today more ways to be creative than the 80s slate of painting, writing, etc. Music can be written and orchestrated at home. Traditional media art has largely given way to digital art. Films can be made on devices that fit in your pocket. I see no reason a modern version of Journey Into Imagination can't be as good, if not better, than the 1983 original. New Sponsor Suggestion: Avid? Google? Apple? Microsoft? Comments: Oh, how 3D has fallen - then risen - then fallen again. In the early 80s, back when the cycle of the 3D revival was just starting to wear out its welcome, EPCOT Center opened with Magic Journeys, a 3D film in development for years by Murray Lerner. A world apart from the excesses of something like Jaws 3D, Magic Journeys was something of a hallucinatory art film supposedly devoted to the imagination of a child but frankly more about being strange, sleepy and kind of freaky. Magic Journeys was shortly replaced by the supposedly more exciting Captain EO, a pure slice of 80s cheese, then by the aggressive spectator punishment vehicle Honey, I Shrunk the Audience. In our own era, 3D has tread an equally strange path. No modern film has managed to rival the success of James Cameron's Avatar, and the domestic market for 3D has continued to shrink. Disney has continued to offer its animated films in 3D for no apparent reason other than that some people apparently prefer it. The much-ballyhooed home 3D blu ray players and televisions have even gone out of production. It's time for Disney to divest itself of their 3D theaters, not so much because of the home 3D discs or the 3D revival, but because of the state of the theme park industry. Many smaller scale attractions like World of Coke in Atlanta, most major city aquariums, and many moderate size amusement parks offer 3D films. The showing of 3D - and indeed similar novelty film formats like Circle-Vision - is a tradition Disney began in 1955, at the height of the first wave of Hollywood novelty exhibition circuit. It's lasted through two more revivals, three company administrations, and nearly four generations. The Magic Eye Theater has trouble drawing in a crowd, and Disney has trouble coming up with things to fill it with. The theater should be gutted and used as additional space for a new version of the Journey Into Imagination attraction. Comments: This is another big one. Of everything that was stolen, appropriated, recycled, and absorbed into the popular culture at EPCOT Center, Image Works was plundered most fully by outside forces. 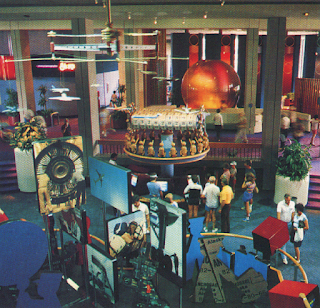 Within a few years of the opening of EPCOT, Image Works' unique hands on whimsy had been copied by nearly every Children's Museum in the country. 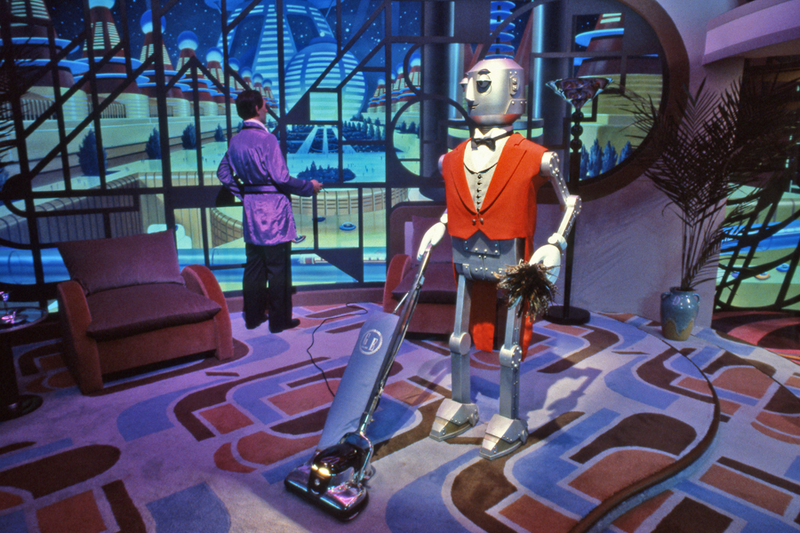 What's ironic is that Image Works, along with Magic Journeys, was one of the few EPCOT installations to come with no built-in Message - nothing but a quiet reminder that even the most average day to day activities come with an oft unspoken imaginative construct. A dark, cool, and fun retreat from the heat and bustle of the park, Image Works was one of those rare attractions where everything about the experience on a physical register was innately satisfying. The approach to the pavilion raised questions about those glass pyramids, questions satisfied by the ascent up the spiral staircase (by unanimous agreement the best kind) and the view of the attraction boarding area below. Once upstairs, the view of the park through those glass pyramids was another kind of reward, followed by the movement into the theatrically darkened Image Works space. Even the contrast between the brightness of the Rainbow Tunnel and the darkened Stepping Tones and optical illusion mazes beyond was innately satisfying. While the current Image Works offers somewhat similar experiences, there are two crucial distinctions which make it less satisfying than its predecessor. The first is obvious: located in a plain room, the ritualistic aspect of the ascent to Image Works is removed. It's the same reason Tom Sawyer Island wouldn't work as well if you could just get there on a bridge instead of a raft. The second is that the "lab" theming steps on the wonder of the original presentation. While the late-90s music conductor game is undoubtably more technologically complex than its 1983 original, showing guests the computers running the operation simply turns the entire operation into an effects demonstration. The original Image Works positioned its effects as theatrical magic, not digital magic, and the appreciation of its audience was palpable. What Needs to Change: besides moving back upstairs, Image Works needs to be given over entirely to WDI's Illusioneering department and filled with the kind of prototype special effects they regularly develop but rarely get to actually use. Image Works is also an area which would be ideal for an exhibit about the history of EPCOT, from Walt Disney's city to the present day. 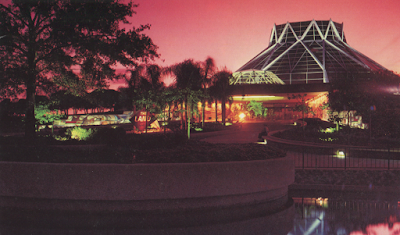 In our memories, EPCOT Center often seems to be a greater accomplishment than maybe it was. As I hope I've demonstrated here by going through every aspect of it's message content piece by piece, in terms of actively looking towards the future, the park presented ideas which ranged from fantastical (Horizons) to retrograde (Universe of Energy) to incoherent (Travelport?). 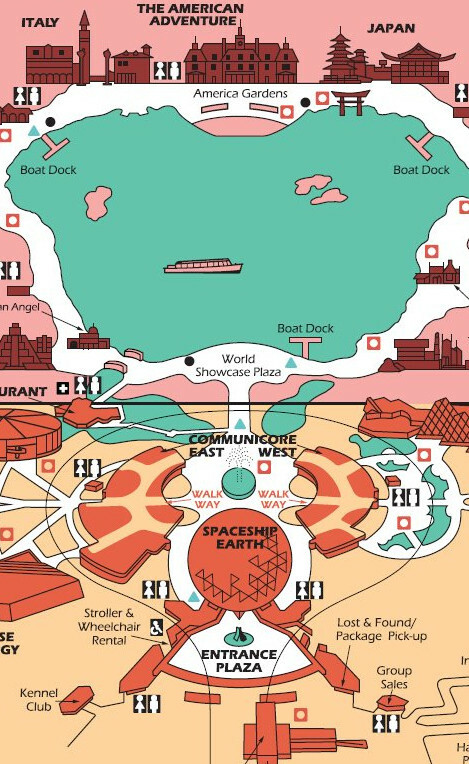 Despite this, in my opinion EPCOT Center was the highest, furthest, most effective summit the entire category of themed design has ever scaled since the opening of Disneyland. Despite its questionable corporates messaging and nonsensical product plugging, EPCOT Center was no less scattershot than it is today, yet something for those first twelve years held the center together in a way it does not now. And here at last we will try to pinpoint it. EPCOT Center was massive and monumental. The size of the walk around World Showcase is still enough to make adults cry. The architectural statements of each Future World pavilion were huge and impressive, but never leaned towards brutalism - instead falling into the Henchman abstraction that I like to call "theme architecture". Yet these gigantic blocks were dropped with symmetrical precision into a landscape which perhaps more than anything suggested a bucolic college campus - with ponds, fountains, rolling lawns and spreading trees. But inside each pavilion, everything suddenly became warm and intimate. CommuniCore offered its visitors handmade art objects like the Population Counter and Fountain of Information, simply there to be enjoyed. Natural daylight, terraced seating areas, varnished wood and wall carpet offered a pleasing sense of tranquility. Subdued lighting and peaceful music complemented the uncluttered, enticing atmosphere. Everything about EPCOT Center's gathering spaces - The Land interior, Communicore, the Fountain of Nations, the Imagination lobby, the World Showcase courtyards - contrasted textures, tactile pleasures, and colors to create environments which invited you to linger. Through the 90s, the scale of these interiors, once criss crossed with walls, plants and natural dividers, ballooned until most of EPCOT today resembles a cross between an industrial trade show and a Wal-Mart Super Center. Tarps, canopies, and unrelated nonsense clutter the sightlines of those monumental pavilions. Carts, pop-up stands, and pin carts dot every walkway. Of all of the parks, Epcot's aesthetics respond the least well to these sorts of theme park mainstays, and they really should be elimiated. You need to give people a reason to get inside and sit down, to get away from the crowded tarmac. EPCOT Center's walkways may have been stark and simple, but once you actually got into each pavilion, you could spend an hour or more in air-conditioned comfort without ever stepping outside. To me this comes down to respecting your audience as well as having respect for the human scale. Disney needs to accept what tens of thousands of locals and fans already know: Epcot is the ultimate hang out park. Each pavilion should be honeycombed with small exhibits, fun diversions, little places to relax and maybe get a drink, in a classy, clean atmosphere. If you give people places they like to be, you'll be surprised what they'll reward you with. This is a big one, and it's a place where Future World needs to entirely start from scratch. As these articles have pointed out, EPCOT was a hive of competing ideas, companies, and ideologies, yet it seemed to speak with a single voice. That single voice is so strong that today is still reverberates in the public mind, twenty years long gone. How many still know it as EPCOT Center, and how many still associate it with some kind of learning experience? That's power. That's power than usually only public figures usually attain, never mind a dorky theme park peddling corporate messages and sentimental songs in equal measure. And one reason the voice of EPCOT Center still speaks through time to us is because its message was scrupulously, carefully aesthetically organized and unified. This is something that got stripped out of EPCOT piece by piece in such a way that it was gone without anybody really noticing it was leaving yet. The demise of Horizons and Journey Into Imagination was only the final piece that fell into place, but just as important to reducing the overall impression of a unified whole was touches like replacing the original wooden railings and carpeted walls in The Land with metal railings and painted walls. Yes, the current look of The Land is, on a micro scale, more modern, but it's less human on a macro scale. The paving of Communicore Central and the removal of all of Hench's softening trees, bushes and ponds is another. Bit by bit, piece by piece, Epcot of today is a far bleaker, harsher place than it was even 15 years ago. All of this is a result of different design agendas within the company. EPCOT Center was unified in 1985 because it was all built at the same time. The Epcot of today is the result of hundreds of different design teams with different project leaders, budgets, expectations and goals. While an organic environment like Magic Kingdom or Animal Kingdom presents areas where one design tough or another is unambiguously out of place or not, there's no generally agreed upon single system barometer for what EPCOT should look like. It's really easy to, say, replace one railing in one place and bump that single pavilion out of line with the rest. This is how you end up with signs that look like they come from the cover of Dreamcast games or random wavy descending walls, a sure sign of a lost and bored designer. Disney needs to write this barometer, then. Every sign in Future World must have specific size, color, and font approved choices. Every pavilion must have a dedicated color palette, approved patterns, approved typefaces, and so on. This is why the Future World pavilion icons worked so well as an organizing principle: pictures require no language translation, and sleek icons are even better. There should be no need for flashing LED billboards to help guests find their way to attractions if there's a streamlined, iconographic wayfinding system. Writing such a manual will inevitably limit the creative freedom of the individual designers creating facilities for Future World, but I cannot see how this would in any way be worse than the garish mishmash we ended up with. The way forward on Future World can be as simple as a start with a strict design standards document, and spread through the rest of the park. Disney is really good at talking down to their audience, and their audience really loves it. There will always be a contingent of Disney fans who love toothless pablum like Wishes, but in Future World and EPCOT in general are going to ever coalesce into what it is in the minds of the public, Disney really needs to commit to taking Epcot, and the Epcot audience, seriously. Taking an audience seriously does not per se mean being humorless or dry. The 1982 version of Spaceship Earth was exactly that, which is why it was reworked to more closely resemble Horizons only a few short years after it opened. Horizons was, despite its eye popping visuals and reassuring message, astonishingly hokey, H.G. Wells by way of Father Knows Best. World of Motion was very funny, Kitchen Kabaret was weird. These attractions offered hopeful apology for their sloganeering, a spoonful of sugar to help the medicine go down. Symbiosis, The American Adventure, Spaceship Earth '94 and to a lesser extent The Living Seas all put it to their audience to be ready to make the world a better place - they didn't let them off the hook. And despite all of that, EPCOT Center did have a profound effect on a generation of a certain age. Yes, it was kids who dreamed of piloting the Enterprise instead of kids who fantasized about having tea with Belle, but isn't that still an accomplishment? Even the lightweight Journey Into Imagination packed an ideological punch. For this five year old child, who didn't much care for science and technology trappings, I walked away floored by that attraction's insistence that I could and should use my creativity to "start making new things". Returning to my ranch house in Connecticut, I scrawled out the lyrics to the Sherman Brothers' Imagination song in black crayon on a piece of construction paper and stared at it for days. That attraction instilled in me at age five the awareness that only I was responsible for getting the ideas in my head out into the real world, and on that wave of inspiration I began drawing volumes. The blog you read now is a direct result of that experience. I may be a castle park kind of person, but Journey Into Imagination changed my life for the better. Thing is, I am in no way alone. You can't swing a cat in the Disney online community without hitting somebody of a certain age who will readily and loudly tell you that EPCOT Center rewired something inside them. This more than anything is the proof in the pudding that Michael Eisner was dead wrong, that EPCOT Center was relevant, and did matter. These two articles have been intentionally limited in their scope - I haven't attempted to re-concieve what Future World should be for 2020 audiences from scratch, for example, but then again that never was the point. The point was to become clearer and reach conclusions on what Future World was really saying, and how it said them. And the conclusion I've reached is that EPCOT Center came pre-packed with a sort of aesthetic toolkit, and it's a toolkit that nobody has used since the 80s. But those tools still work. They can still make muddled messages sing and send the next generation home with the sort of elevating experience I had. Kids need to see a place that doesn't just tell, but show them that science and technology make our lives better - they needed it in the 80s, and they need it today. It's never going to be perfect, but the next generation deserves a demonstration of mankind's better nature. "If you can dream it, you can do it" may not have been said by Walt Disney, but that doesn't mean it isn't worth saying. "...without hitting somebody of a certain age who will readily and loudly tell you that EPCOT Center rewired something inside them." Well put, in my late 20s now, I can still recall feeling amazed and inspired by many things in Epcot. It absolutely played a part in creating the person I am today. I also like the suggestion of reintroducing hands on exhibits. I never thought of it as the ultimate hang out park, but it truly is. Mental thrills can be just as memorable and enjoyable as physical ones in a theme park setting. EPCOT had a real sense of exploration and discovery to it. You felt like you could walk around a corner and come across a display or a game or what have you, even in the shops, which had lots of scientific toys. And at least for a child who'd never traveled abroad, the World Showcase had the same feeling. EPCOT could cheaply recreate that by investing in things which fit the theme that you could watch or play with, like putting models of geothermal or hydroelectric power plants in the Universe of Energy pavilion. Nothing really expensive, nothing that requires a Fast Pass, just lots of things to look at with a physical footprint to take advantage of all that space. Carts selling stuff doesn't convey a feel of discovery, just a feel that the new theming was designed by accountants. "It wasn't that the serious messages of EPCOT didn't resonate with a large number of people (see the success of science museums across the country) - it was that the message didn't resonate with the kind of people who rose to executive positions in the entertainment industry. (And still doesn't, if the rumors of GotG replacing UoE are true)"
That seems to be the case with a lot of things at Disney: despite there being more venues to actually connect with its consumers than any time in history, there seems to be a growing gap between what fans want and what the company wants to sell them. The Old Disney treated the act of selling as merely a means to an end, the end being an idea that inspires someone to do something great and to help make the world a better place. The New Disney treats the act of selling as the end in itself. Another problem is one that they should have seen coming as they helped sew the seeds for it in the first place: the "future" they talked about in the 1980s is essentially now in the sense that we are more inundated with technology than ever before, and much of what EPCOT is priming the pump for is old enough to be retrofuturism by now. It's hard to get excited about something that's become a mundane part of everyday life. Just re-theming it with cheesy and preachy renditions of the most popular and profitable IPs is not going to cut it. Anything from Frozen belongs in the Magic Kingdom, Star Wars was fine where it was but is getting its own land anyway, and there are limitations on how Marvel characters can be used, but I'm sure those will be loosened incrementally in good time. 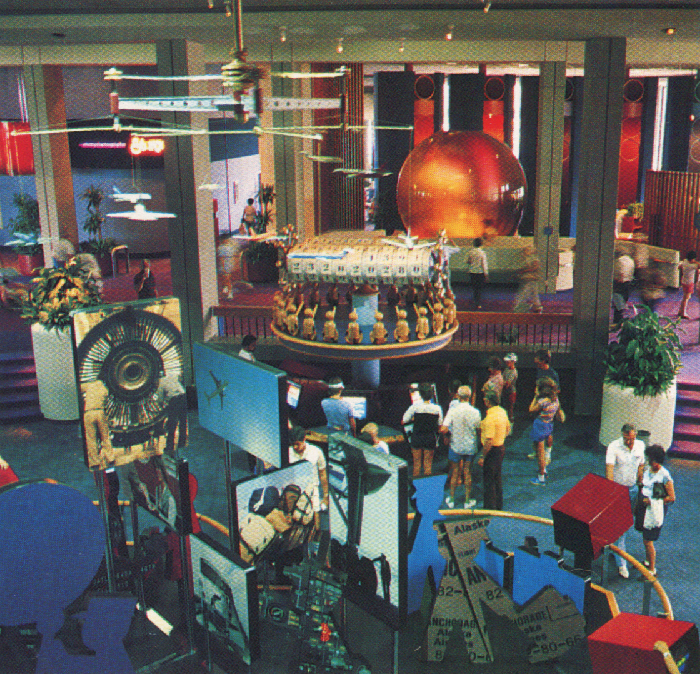 Universe of Energy could very easily be updated to reflect more recent research. Improve the mechanics, keep the song; nothing in the lyrics mentions fossil fuel by name, in fact lyrics like "from the sea to the skies" suggest the potential of water-, solar- and wind- based power systems. And frankly, it might be in their best interests if they dump Exxon as a sponsor; much like Nora in Pete's Dragon did when confronted with incontrovertible physical evidence of Elliott's existence, they saw the evidence about climate change decades ago and denied it. Of course, they did business with Monsanto when Walt was still among the living. 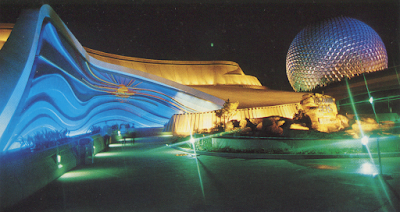 I love these articles and really miss the inspiring futurism of the original EPCOT Center! Thank you for your detailed trip down nostalgia lane. My wife comments that you are my spirit animal. I eCho some of your previous comments that your blog at the sametime fills me both me with positive, hopeful memories of the past and frustrations of how Disney has gotten away from what made me fall in love with it in the first place. I still love Disney. I love the things you love(d) about it not limited to theming and architecture. My favorite moments on any Disney trip were never the shows or rides. It was usually sitting in a quiet spot feeling like I was transported to a different time and space. That could be achieved in any of the parks. But growing up EPCOT was my favorite because of its vast open spaces and nooks. To date, we spend many a night playing cards listening to the EPCOT Entrance Theme on YouTube (it's still very good!) Great inspirations from original rides like World of Motion and Horizons. I visited Disney World last in Feb of 2015 and also had trips in 2012, 2009 and 2003 and as much as I love it and would want to go back in an instant, I told my wife that we needed to hold off for close to a decade. I needed to let things refresh. It seems like resources have not been dedicated to Magic Kingdom, EPCOT and Hollywood Studios in many, many years. Animal Kingdom had taken over as my favorite park. Hollywood Studios and EPCOT are shells of what they once were. Whether dollars were being poured into Shanghai or Paris or wherever, the times quickly caught up with WDW. Encouragingly, however, it looks like that is changing. While I am not a Star Wars nut, there could still be some wonderful elements that could help improve a dying Hollywood studios. We did however visit Disneyland this past February and was delighted to see how "full" disneyland and California Adventureland felt. After reading your end of year summary I was saddened to know that I was going to miss visiting the Big Thunder Mtn ranch area and I thought the Rivers of America was going to be drained. However I was able to enjoy that whole area in all its beauty. My wife and I even accidentally stumbled onto Club 33 (we didn't know what it was! But we were quickly shuffled away). You were SO right about Pirates being a much better experience in Disneyland. One thing that Disney World did much better than Disneyland however is the queuing. Disneyland has very few fun queuing experiences, exception being Indiana Jones. I understand why but it is worth noting. One of favorite queuing experiences is Space Mtn in Disney World. It always gave me a sense of excitement that is missing in Disneyland. In short, thanks for sharing your eloquent thoughts. I will always continue reading and sharing with others. PS - Favorite moment of corporate propaganda in Spaceship Earth is in the scene where Egyptians invented the first paper called papyrus, Dame Judy Dench makes the obvious connection that this one moment in time led to the unfortunate creation of taxes. Lol. Considering Tony Baxters power within Imagineering 5 years ago, along with Iger pushing to be diffrent then Eisner, I really thought The Journey Into Imagination restoration would come to pass. Along with a mild refresh of UofE. Also the 30th celebration and how much Figment was pushed... But instead the budget went to new Fantasyland, then Disney Springs, Now Animal Kingdom, and Retooling the Studios Completely... And Epcot is still left with all its Eisner scars intact. Considering how cutting edge parts of Imagineering is, they should be ashamed so much of its best work is in such a sad state. And now more then ever a permanent optimistic worlds fair is needed. You also need an indepth article on the music of Epcots first ten years. I disagree with what you said about the payoff of the original JTI attraction. The ride builds itself up in the same way a traditional story structure does: we learn about different areas of imagination until we're finally in one big room where we see Figment putting all of those ideas, and others, to use, or at least imagining all the things he can do. The "film" aspect never bothered me, and I never made a connection to Kodak. I think the Imagineers were trying to say that the things we create can be visualized on screen. Obviously, a modern update wouldn't hurt. There would have to be a balance, however, between physical activities (painting, playing pretend, arts and crafts) and digital activities (editing music and video, Photoshop, designing games, etc). I'm not sure how deep they'd get into that aspect, but I think they'd have to be specific. We don't want a guest going away from this thinking that playing Flappy Bird is suddenly considered "creative." Oh, and eliminate the photo-taking at the end. I was impressed with that as a kid in the late 80's/early 90's, but we've come so far since then. Your comments about JII are spot on. I've been fortunate to become involved in so many creative programs throughout the years where I've been able to learn what I'm good at, and then home those creative talents. I truly believe that seeing that attraction at a young age propelled this sense of creativity within me. Who can say that nowadays, that a ride changed their life? But it's completely true. It's just sad that those who didn't experience the original don't always seem to understand Figment's appeal. When I worked at WDW, I had a co-worker who was only familiar with the new ride. He thought Figment to be annoying. I tried to explain that the original purpose of the character was to represent a child coming into the world, a person beginning to realize all the great things they are capable of. That's why Figment is still enduring to me and many others. His starry-eyed optimism is truly a Disney touch. It's sad that others don't see that, and it's sad that there may never again be a ride a powerful as this one or Horizons. As a died in the wool EPCOT Center nut, can't say enough about these write-ups, excellent stuff. I'd go to bat a bit for Wonders of Life, but part of that is shaped by my love of Cranium Command and the fact that Wonders opened in '89 when I was 4 years old, so it was in my wheelhouse all that time...and even though it broke some of the aesthetics of EPCOT Center, at the time it was a bit refreshing to see a pavilion do things a bit differently while still working largely within the EPCOT framework. Now, had I known EPCOT would go in the direction it wound up going after that? Maaaaybe a bit of a different opinion. There's a lot of buzz and rumors flying around that Disney does realize that EPCOT, namely Future World, could use a lot of work (though World Showcase would do nicely with another small boat ride or two...can we please dust off a few ideas like Rhine River, please? ), but it's tough to make heads or tails of what's on the table. The loudest buzz right now is that they're going to shoehorn Guardians of the Galaxy into Future World by taking over the Energy pavilion, which effectively kills the pavilion concept dead. However, there's also talk of a major investment into the park, even perhaps an idea big enough to be labeled "EPCOT 3.0", and some of that buzz is a bit more positive...if it's positive, I have to believe it would include a plan to rehabilitate Imagination. Regardless, it's astounding that Disney can't seem to figure out what it has in EPCOT. Foxxy, you put it 100% best: EPCOT is the greatest "hang out" park in the Western hemisphere, or at least it should be. It's not a park in desperate need of thrill rides; even in its current state it's still the sixth most visited park in the world, so simply showing a bit of love to some pavilions would do the trick, and that could be cost-effectively done via simple Omnimover attractions, more art installations and street performances, some more hands-on displays, perhaps a slight museum aesthetic...basically bringing a taste of World Showcase over to Future World, at least with regards to the pace you're meant to experience it at. My personal pie-in-the-sky dream is to see them utilize the expansion space they have for CommuniCore and use them to grow the buildings and really emphasize the "community" part of that name by using the extra space for things like performance halls, art exhibits, tech demonstration space and hands-on science museum-esque concepts, even rooms for things like discussions of major issues, and then use those to reach out to local universities and agencies to hold events there, many of which could be open to the public or part of an extra ticket. Then, depending on the thing you're there for, give the people involved name tags with pavilion logos on them to match. Here for the chamber music concert? Here's your Imagination name tag. Here for the discussion of alternative fuels? Energy logo name tag. etc. etc. ...I know, I know, it's just fun to dream. This 1982 feature story on the syndicated program "PM Magazine" that aired prior to EPCOT's opening, has a remarkable admission about a master plan for EPCOT to carry them through to the year 2000 with room to expand to up to 30 countries. Sure makes you wonder what happened to that master plan! Considering their idea of an improvement was to take an existing ride people liked that was based on a country that actually exists and turn it into a ride based on a popular movie set in a fictional country, I don't think that master plan was too much of a priority under any of the post-1984 management regimes, and it certainly seems to have been forgotten long before 2000. Maybe they didn't want to get caught in the middle of certain geopolitical conflicts and be forced to take sides. I wish I knew. My thought: the Seas should become the Skies...still water focused, but now with NOAA as a partner. We know so much more meteorology, can predict more days in advance, lots of citizen science opps (like CoCoRahs), competing models. A ride could be being a drop of water, from ocean, to rain or snow, to drinking water....(omnimover "shinking" us, and the cars being shaped like droplets). There are a lot of weather myths, and I'm sure someone could do a cartoon explaining why we have different models for weather events and why they disagree. A thrill ride could be like the a cross between star-tours and the design-a-coaster thing, but pre-designed (though intensity customizable) and based on electricity -- lightning (very wild part) to controlled loops from powerco to home, powering batteries as we charge devices? The sucking feeling of a vampire device (like a tv that's always drawing power).... a city losing power or having brownouts.... just some thoughts. I adore your articles!! Terrific evaluation of the current state of EPCOT. I haven't been in years and I don't care to. I was in elementary school when I first visited in 1982/3 and it became my favorite park as well as solidifying my personal trajectory to becoming a full fledged nerd. Glad to see that designation has become a badge of honor in equal standing in this current generation...I wonder if EPCOT Center had anything to do with that? 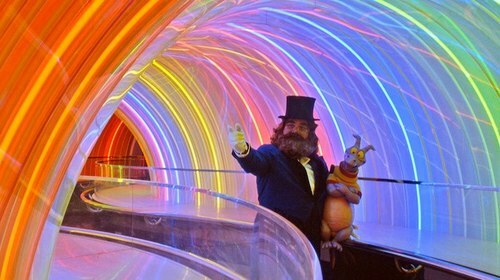 One critique - how could you review Journey Into Imagination without mentioning, by name, the single greatest character (and his 'creator', the Dreamfinder) ever created strictly for a theme park ride?!?! Perhaps if you go into your closet with a mirror, light a candle, then spin around and say his name three times, he'll appear and fly around! Say it with me...Figment...Figment...FIGMENT!!!!! Honestly? 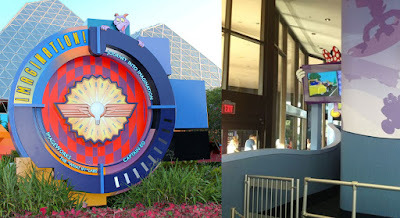 I think I'm gonna get some flak for this, but assuming no one will sign off on bringing back the original Journey Into Imagination, I'd just as soon use its worthless current state as an excuse to gut it and replace it with something new. In a park devoted to science and technology, a pavilion about "imagination" with a cartoon dragon mascot always seemed out of place, as popular as it may have been with the kiddos (which, I'm sure, is why so many people miss it; they were kids themselves being dragged along to this otherwise dry, PBS-y place and latched onto the one obviously cuddly and kid-friendly thing they could find). And what would this new pavilion be about? Digital technology and its use in bringing fictional worlds to life, from the early history of video games to the promises of virtual reality. It's the one topic that's conspicuously absent at the moment (besides biology, which would be covered if they brought back the Wonders of Life in some form). The sponsor? Valve, of course, who has plenty of money to burn and a desperation to sell the public on VR. As a plus, they have a history of designing their games like interactive, walk-through dark rides, so designing an actual theme park attraction should be right next door to their wheelhouse. They could even find a way to work Figment back into it, I'm sure. I agree about the need for a digital technology exhibit, but not as a stand-alone pavilion. Put VR in one quarter of Communicore, er, Innoventions. 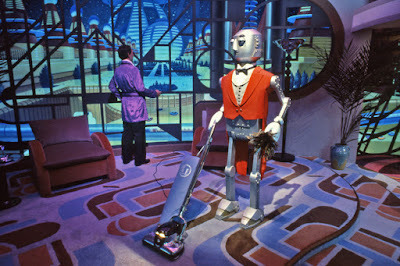 As another blogger put it, Imagination is the beating heart of EPCOT Center. My own take? 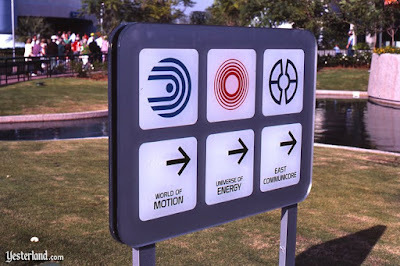 EPCOT Center had a broad spectrum of emotions that ran deep. Imagination was lighthearted, Horizons playful and inspiring, SSE uplifting (see what I did there? ), UoE a little bit scary and serious, etc. My favorite scary moment - the film in the Living Seas. That pinging in the dark...gives me chills to remember it. There was a sense of trepidation about discovery, going down into the deep dark oceans.